Along with a personalized at-home skin care routine and regular professional treatments, such as Dermaplaning, Microdermabrasion or Microneedling, we usually recommend a regular program of light facial peels. Light peels will help accelerate the effectiveness of your products by opening up the skin and helping it absorb the products. Light peels work by gently removing dead skin cells. The regular removal of dead skin layers means the skin health products are always working on the healthiest skin. Peels also provide the added benefit of a generalized tightening of the skin which makes it look smoother and more supple. At Advanced Cosmetic Surgery & Laser Center, each of our skincare services listed below are customized for the needs of each particular patient. Ask how you can save 10% or more on your services by joining our WISH! Advanced Loyalty Rewards Program. A quick, non-invasive procedure that rejuvenates and revitalizes the skin by removing dead skin cells and fine, vellous hair (peach fuzz) on the face. This procedure improves skin texture when performed alone, but is especially effective when combined with a peel. 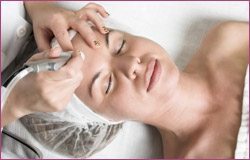 Giving your face a cocktail of dermaplane with a chemical peel will produce stunning results. Creates thousands of micro-channels in the skin that allow nutrients to absorb; the channels close after several minutes, locking in the anti-aging nutrients and anti-oxidants. Cost effective and good for most skin types, 1-3 day down-time. Chemical peels superficially injure the skin that provoke a wound-healing response that expels dark pigment. Peels treat wrinkles caused by sun damage and aging. For optimal results, peels should be done regularly once a month for 3-5 treatments. We offer a wide variety of light peel procedures, most of which cause very little skin irritation or peeling. A skin health specialist who is closely monitoring your unique combination of products will be in the best position to recommend a peel depending on where you are in achieving your goals. Light chemical peels can be a routine part of maintaining a normal, healthy skin appearance. Many patients enjoy having a light peel as a quick perk-up several days before a major event such as a wedding or class reunion. Peels aren’t necessarily limited to the face. We have many patients who enjoy the benefits of a peeling treatment applied to the neck, hands or forearms. A light peel in these areas fosters smooth, supple skin. Our never-hurried customized facial deep cleanses, balances the skin’s moisture, and relieves stress. A series of four to eight bi-weekly treatments yielding remarkable success in the treatment of acne, from teen bacterial to adult cystic and hormonal breakouts. Problem areas may include face, neck and chest, as well as the back. The PCA Oxygenating Facial stimulates oxygenation and circulation within the skin, rejuvenating sluggish, stressed or acne affected skin as it draws oxygen to the skin’s surface, resulting in a radiant, healthy glow. This treatment is appropriate for use in between peel treatments or when exfoliation or flaking is not desired. This treatment is also ideal two or three days before a special event! Acne Treatment: A series of four to eight weekly treatments yielding remarkable success in the treatment of acne. Using lights to penetrate the lower layers of your skin and initiate a reaction that destroys acne at its root. For optimal results, at least 8 treatments over a 4-week period are recommended. Works to improve the overall texture of your skin by addressing a wide range of common concerns.